Today takes the cake! We'll be making a paper-pieced dessert as the second block of the Wonderland Quilt Along. I used Daisies & Dots by Piece O'Cake Designs for Robert Kaufman for the background, Michael Miller Stitch Square for the cake, and Curious Dream Orange That Way for the frosting. The important aspect in choosing your fabrics is having contrast between the object and the background. Non-directional prints are much easier to work with if you mind the print being turned upside-down or sideways. Print your pattern on either copier paper or specifically designed newspaper-like or velum-like paper-piecing paper. It's very important to make sure your printing is set to 100%. Printers are evil, and wickedly jealous of all the love sewing machines get, so they will try to mess up your block if given a chance. Keep an eye on them! (Scale: 100%) Measure the 1" box on the printed pattern to make sure it's 1". If not, the scale is off. 1: 6 1/4" x 2 1/2"
2: 6" x 1 1/4"
3: 6 1/2" x 2 1/2"
4: 1 1/4" x 5 1/2"
5: 7" x 1 1/2"
6: 7" x 1 1/4"
7: 4 1/4" x 4 1/4"
8: 4 1/2" x 9"
Cut larger if you have less experience with paper-piecing. 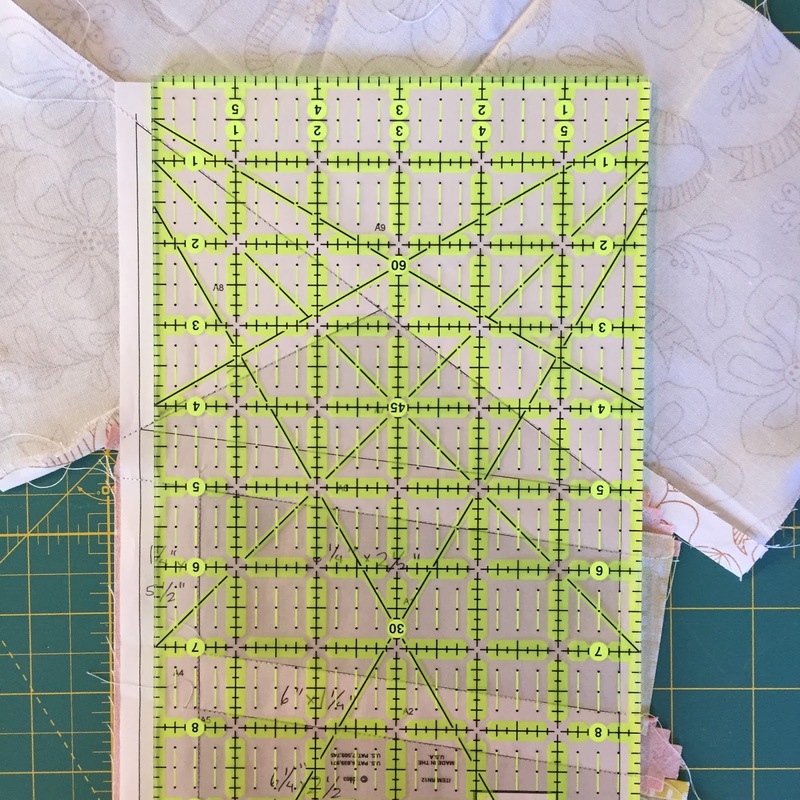 Pre-fold on all the lines. 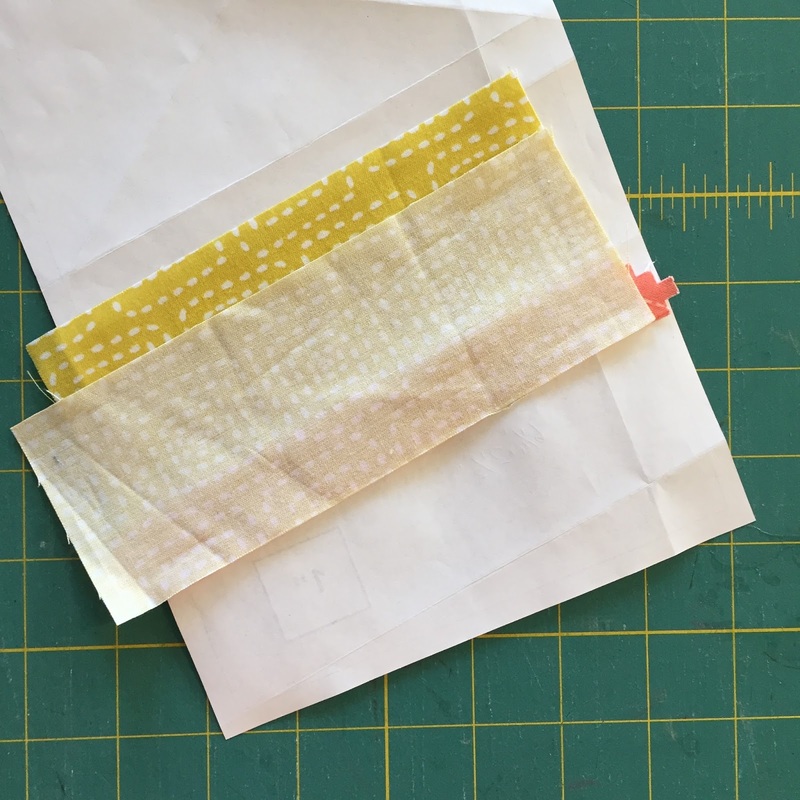 Label each section of the paper with the color you want it to be. 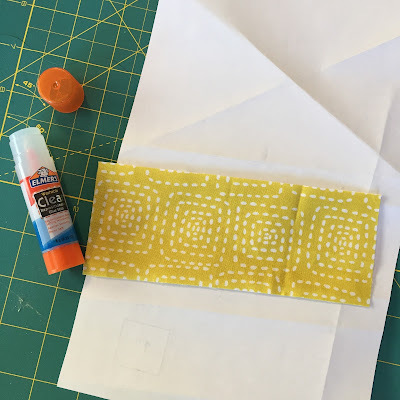 Use a glue stick, or pin, to attach the wrong side of the piece of fabric to the back side of the paper, covering the first section with at least 1/4" protruding on all sides. 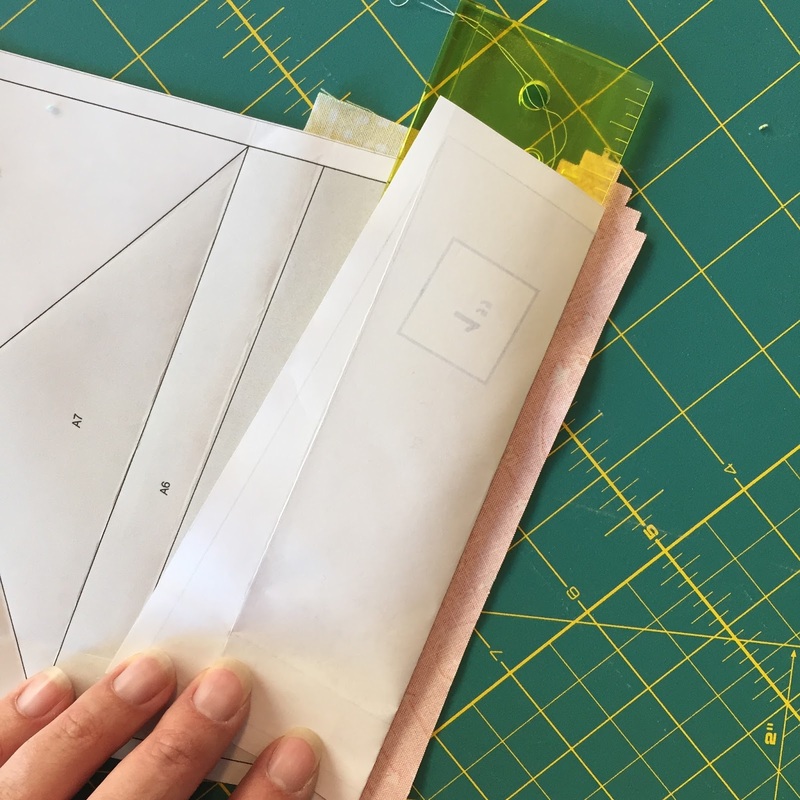 Fold the paper on the line between the first and second sections over a hard edge (flat ruler, postcard, rectangle of template plastic, etc.). Section 1 should be below with section 2 laying on top of it. Use an Add-A-Quarter Ruler (Craftsy link) or acrylic ruler to trim to 1/4". 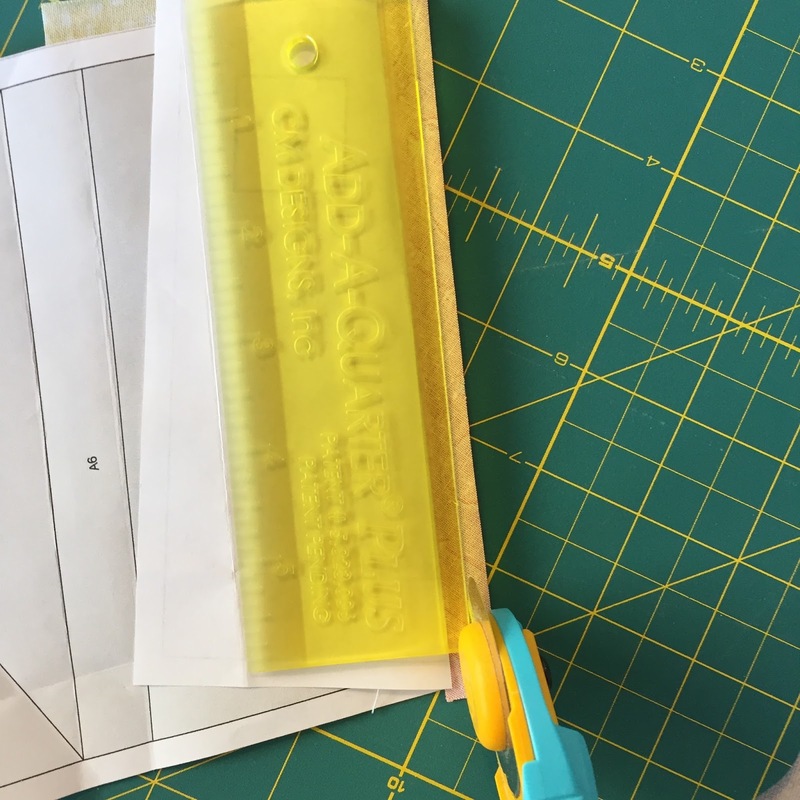 I prefer the Add-A-Quarter Ruler (Connecting Threads link) because it has a lip on the bottom that catches on the folded edge of the paper to lock the ruler in place at the 1/4" mark, making trimming mindless, as there's no need to find, align with, and hold steady at the 1/4" mark like you need to do with a typical acrylic quilting ruler. The Add-A-Quarter Plus has a tapered side for folding over in leu of a separate hard edge device. They come in 6" and 12" sizes. The 6" is less cumbersome and can be slid along a larger edge, but the 12" (JoAnn's links) is more suitable for longer seam lines. 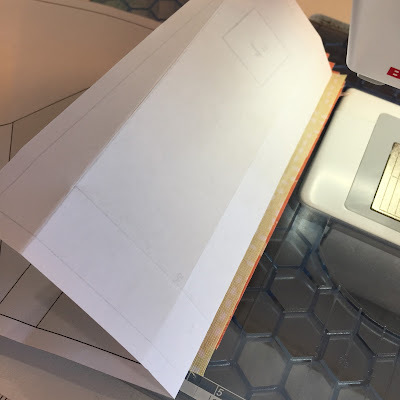 Measure the second section and cut a piece large enough to cover with 1/4" extra all around. Lay the fabrics right (pretty) sides together on the wrong side of the paper with the raw edges aligned. 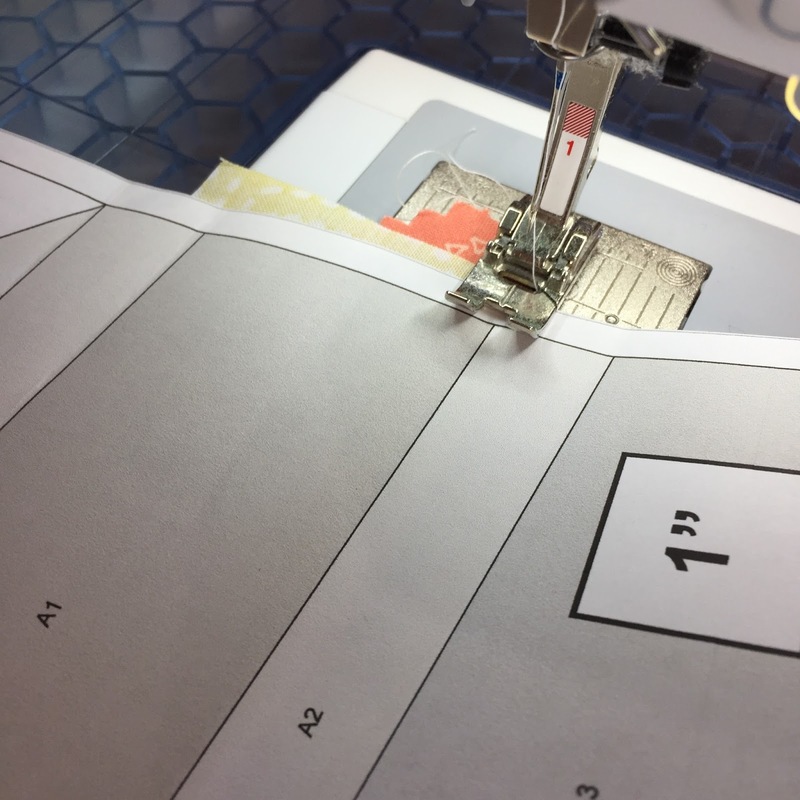 Place a pin 1/4" in from and parallel to the raw edge (It should run along the line between sections 1 and 2 on the other side of the paper.) 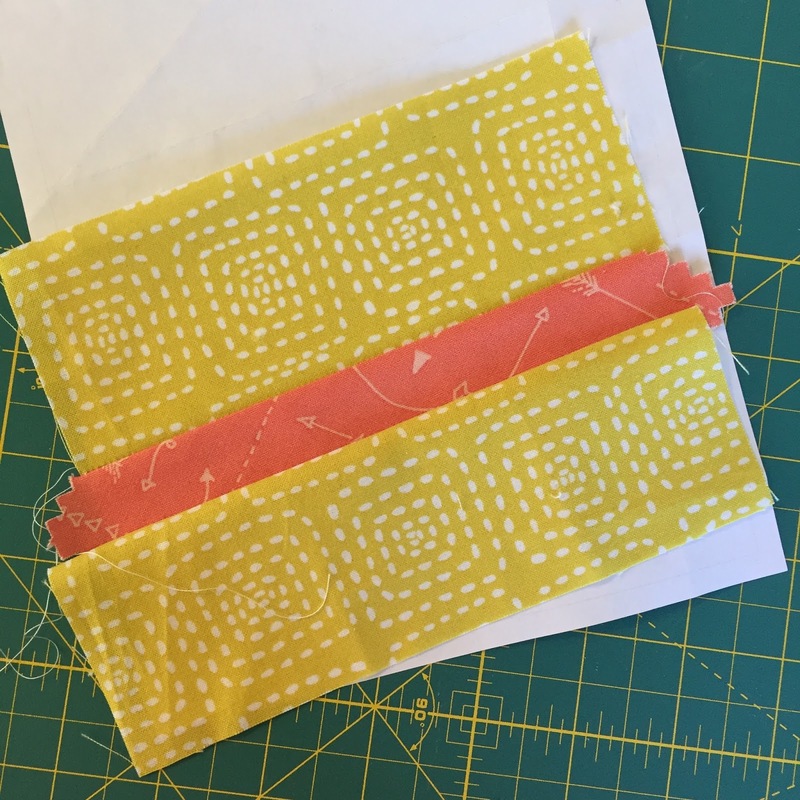 and flip the second piece of fabric open to make sure you didn't cut it too close on fabric. Hold the piece up to the light to see through the paper enough to evaluate. 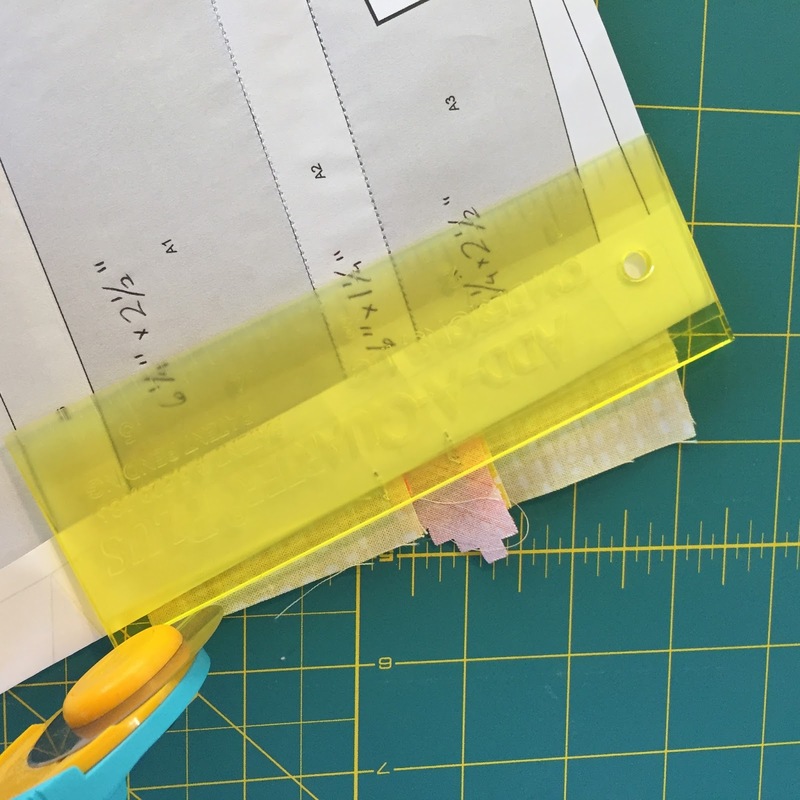 Cut a bigger piece if you're not confident with your coverage of section 2 including seam allowance. Remove the pin you just placed. Check to make sure the raw edges are aligned. 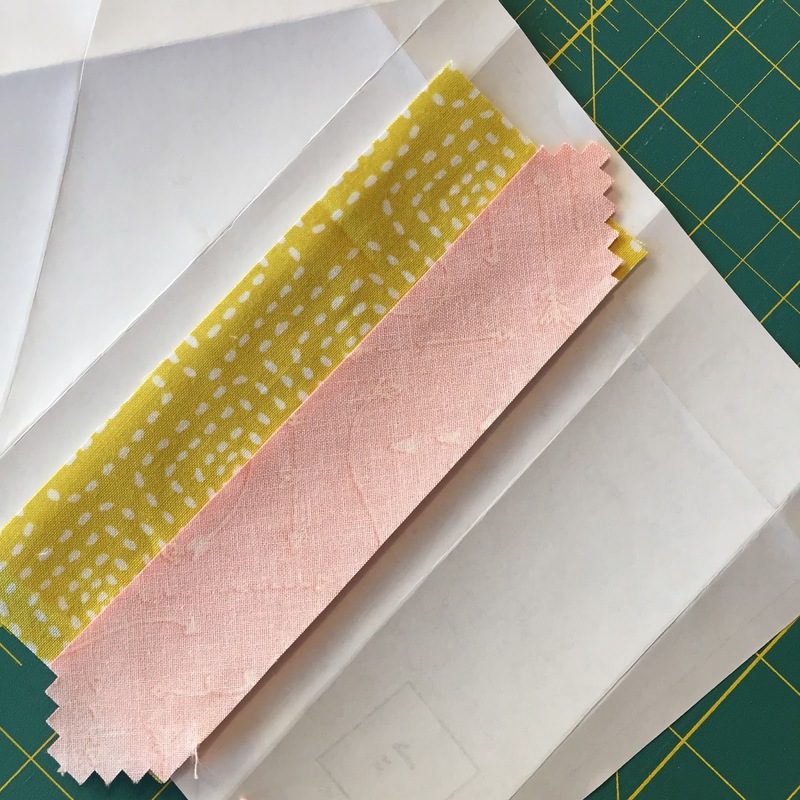 If you have a darker fabric for section 1, make sure the second fabric extends just a smidge beyond the first fabric to prevent shadowing. Flip the paper back down, and adjust your stitch length to around 1.8 (teeny tiny). 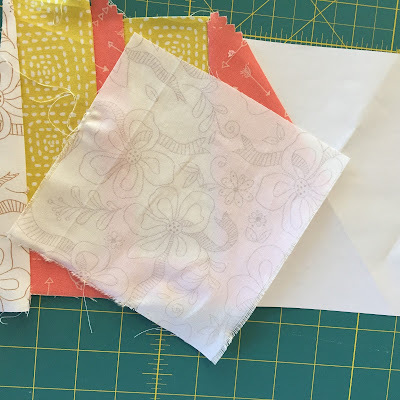 Use neutral piecing thread. I'm using Aurifil (of course) 50wt (A larger number will make the seams bulkier than I want.) from my Curious Dreams thread collection because I wanted 50 wt. threads to match my fabric selection for piecing and 12 wt. 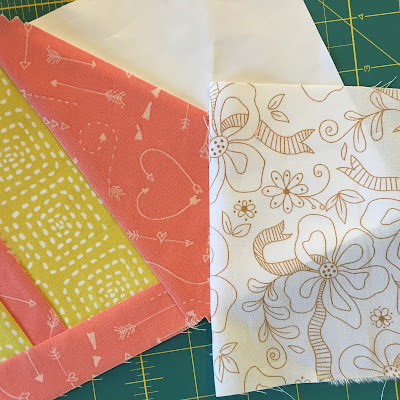 for decorative top-stitching during quilting. Single large spools are available too from Craftsy and Fat Quarter Shop. 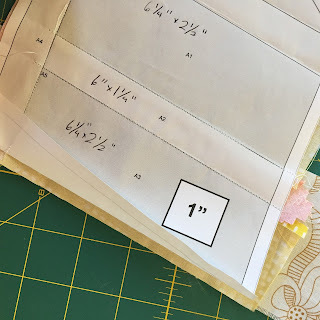 Begin sewing along the line, starting 1/4" before he line and ending 1/4" after, pretending the line extends a bit farther than it actually does. Don't backstitch on either end. It's not the case with this seam or block, but if you had intersections along the seam, first sew a line line of long basting stitches over those portions of the line, flip the fabric open, see if it matches up nicely, and then seam rip to do over or continue wit the itty bitty stitch setting. This is because ripping out microscopic stitches is only for a person you hate, and you're too nice to have someone like that. 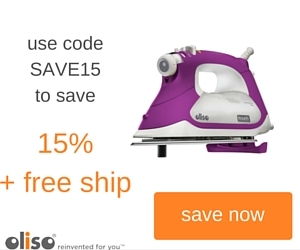 Press open with an iron, or a roller toy tool. 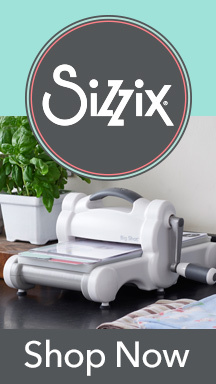 This is a good time for a small pressing and cutting station within arm's reach unless you like exercise. If that's you, good for you, I won't judge. Now avert your eyes while I nosh on this donut. Or cake. For some reason I feel like eating cake. You have completed the hardest part. Now the process just repeats until you finish. Since the first line of sticking is holding your pieces to the paper, you can put the glue stick (or pin) away. 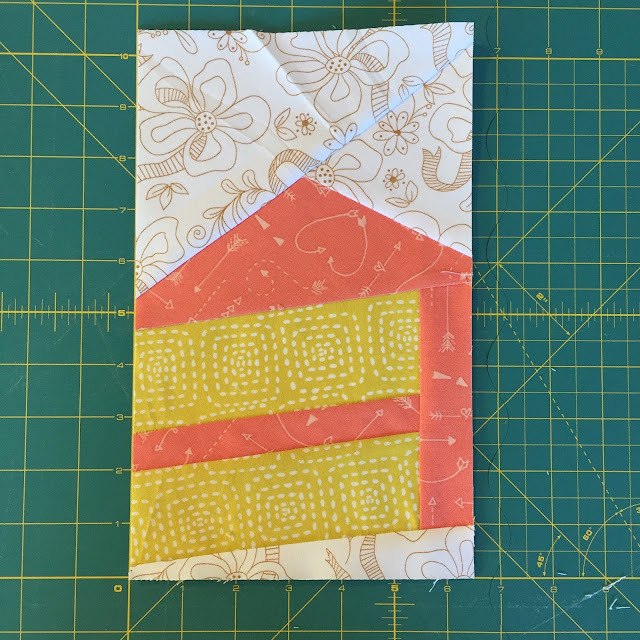 Fold the third section of the paper back on top of the second along the line between pieces 2 and 3 using your Add-A-Quarter Plus or hard edge. Trim the seam allowance to 1/4". Measure a piece for section 3 (or check the chart above and add a little wiggle room). 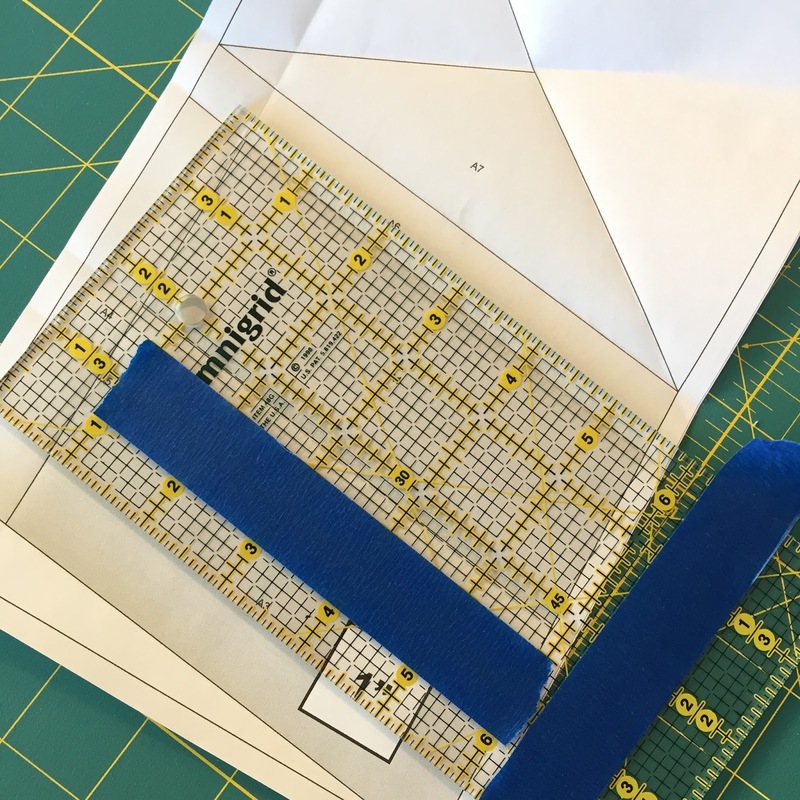 Align the raw edges. Do a test flip to make sure everything is looking good. Sew along the line between section 2 and 3 using a shortened stitch and starting in the seam allowance. Press open. You should only be seeing right sides of the fabric. Nothing should be placed on the printed side of the paper. 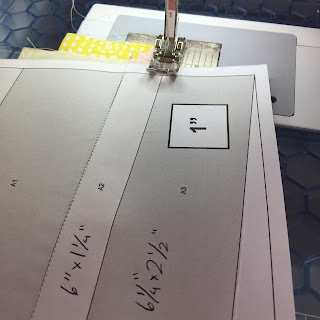 Fold the paper back on the line that serves as the side of section 4. 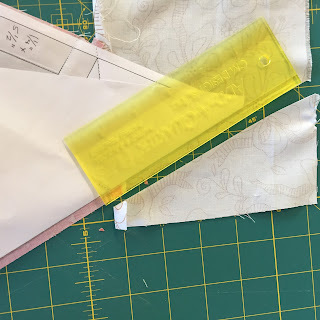 Trim the seam to 1/4". 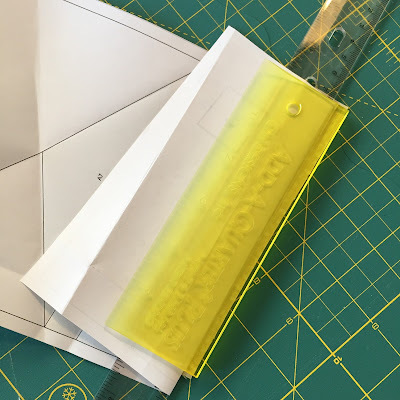 Cut a piece for section 4 and attach it as you did with the previous pieces. 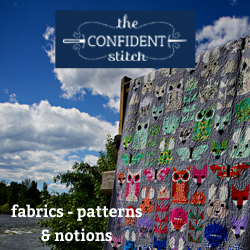 Press to reveal the right side of the fabric. 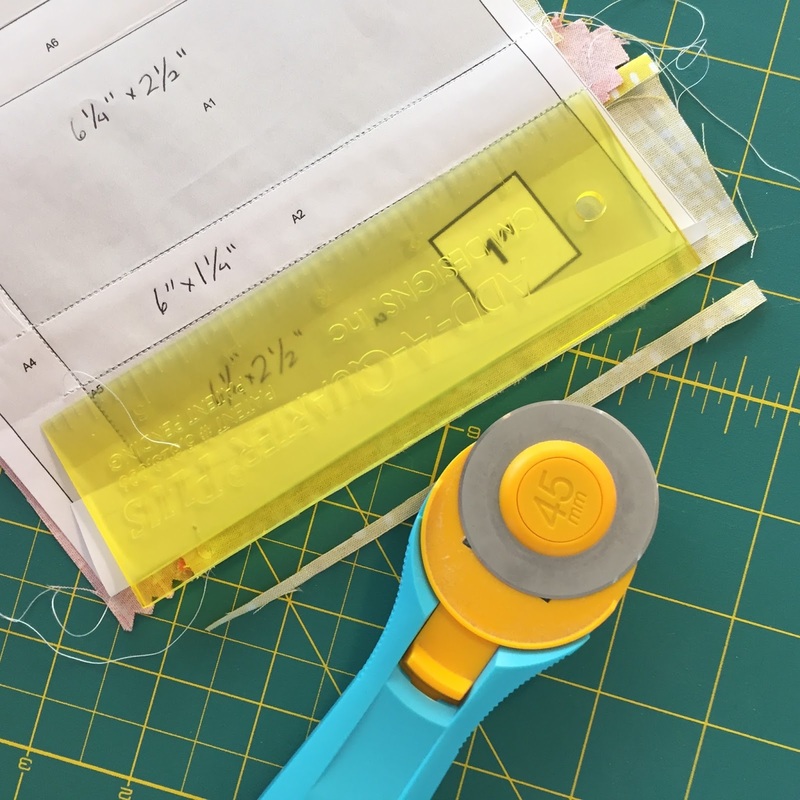 Trim the seam allowance extending over the line that serves as the side of section 5 to 1/4". Attach the fabric piece for section 5. Press. Attach the remaining pieces in the same manner. I made piece 6 big enough to cover sections 6 and 7 because I felt like having them the same color. 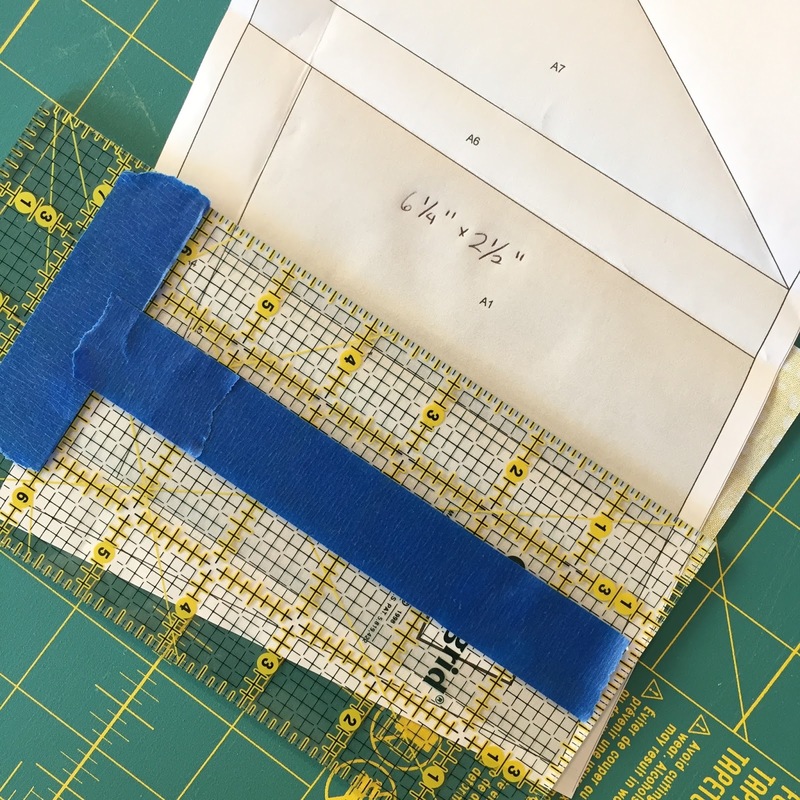 Continue to cut the seam allowance to 1/4" between sections. You can leave the portions at the edge of the block alone for now. Press and admire you handiwork. 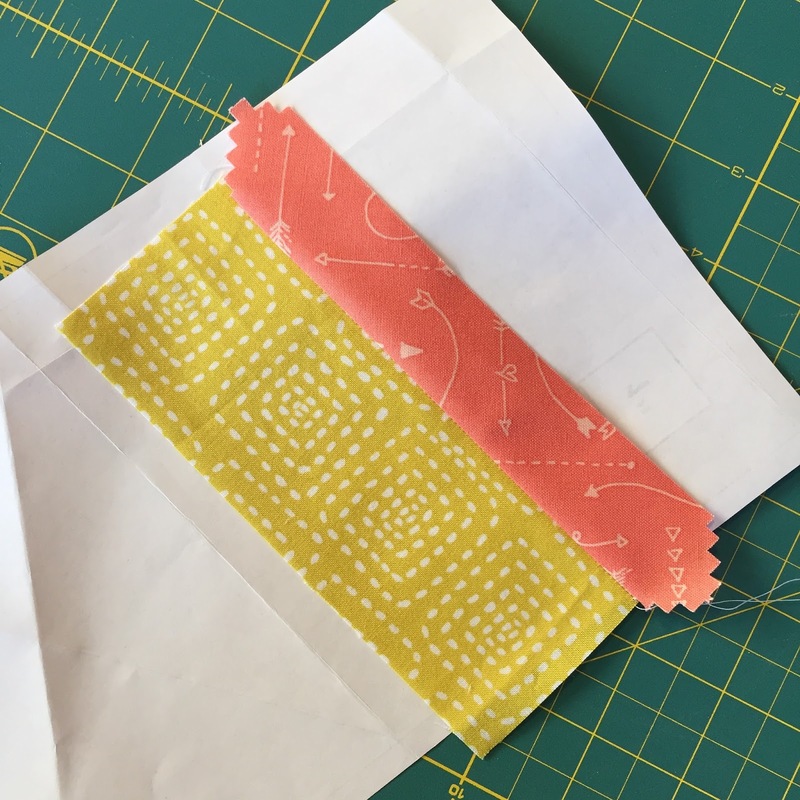 The block will be the reverse of how it looks on the printed pattern since it was built on the back of the paper. Trim the block to 6 1/2" x 10 1/2". Remove the paper by folding along the seams, placing your thumb along the line of stitching at the top to prevent pulling out stitches, and rip down along the seam. 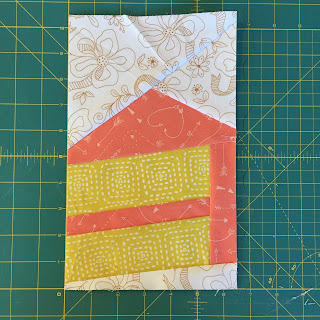 Don't forget to follow Quilting Mod via e-mail or a blog reader of your choice, so that you don't miss out on any monthly blocks. 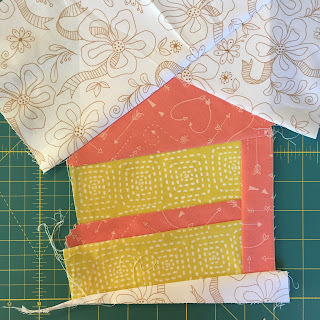 Socialize with others and share your blocks at the Wonderland Quilt Along Facebook Group. Share your progress by using #WonderlandQuiltAlong on Instagram and linking up below. 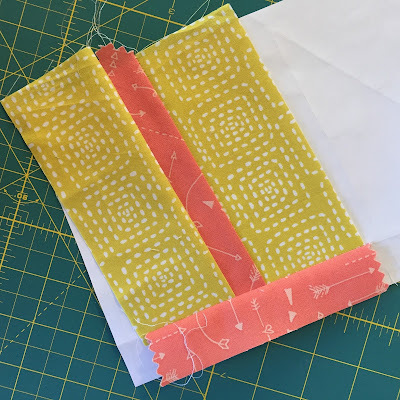 Disclaimer: Aurifil has kindly sponsored the thread for this project, but it would be my thread of choice regardless. Also, there are some affiliate links above, which will not cost you any extra if you make a purchase. 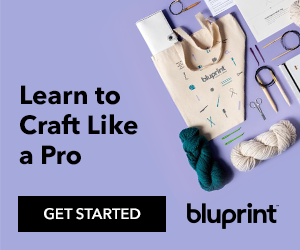 While I appreciate any buying you'd like to do through my links, my main purpose is to help provide information about products I use in case you're interested in trying them out yourself. What a wonderful, in depth tute! 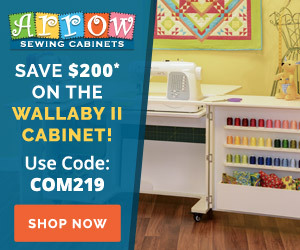 Is this available as a pdf on Craftsy please? And now I'm hungry for cake before 8 in the morning. Argh! 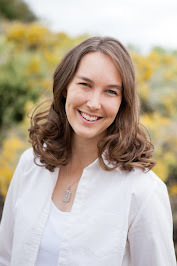 ;) Thanks again for linking up with the Tips and Tutorials Festival, Afton. Lots of great detail in this tutorial, and yes now I want to eat cake as well.